My recent trip to Oregon found fresh local blueberries at almost every corner store and fruit stand. It was so wonderful to have fruit bursting with sweetness that I had to find more ways to feature them at meal times. 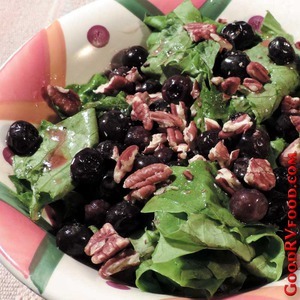 Adding a hint of lemon tartness in this salad works nicely with sweet Oregon summer blueberries. This is a wonderful summertime flavor that can use up left over chicken to make a refreshing and satisfying salad. In a bowl combine yogurt, mayonnaise, red pepper flakes and salt. 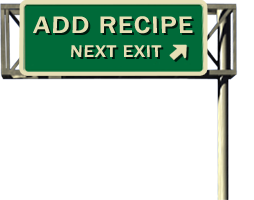 Mix well and set aside to mellow while preparing the rest of the ingredients. Wash all of the blueberries well making sure to remove any remaining stems and set aside some nice plump ones for the garnish. Chop the celery and bell pepper into very small pieces. None of the pieces should be larger than a blueberry. Chop the chicken and combine everything together in the bowl with the dressing. Mix gently to evenly coat but not mash too many of the blueberries. Cover with a lid or plastic wrap and refrigerate for about half an hour to allow the spices to work their magic in the dressing. I like to serve this over a bed of lettuce or spinach but any salad greens work well. Garnish with remaining blueberries. A few fresh lemon slices make for a very pretty presentation.